These cute little pizzas are a delicious meatless option! 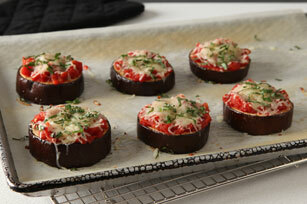 Place eggplant slices in single layer on parchment-covered baking sheet; brush both sides of each slice with dressing. Bake 25 min. Meanwhile, heat oil in medium saucepan on medium heat. Add garlic; cook and stir 1 min. Stir in tomatoes and sugar. Bring to boil; simmer on medium-low heat 20 min., stirring occasionally. Heat broiler. Top eggplant with tomato mixture and cheese. Broil, 6 inches from heat, 3 to 4 min. or until cheese is melted. Top with basil. These unique pizzas are high in fibre, per serving, thanks to the combination of eggplant and tomatoes.